Do you want to Know about Aadhaar Paperless Local e-KYC? Then you are in the right place. Aadhaar Card is one of the most prominent Documents in India used as an Identity of a person. For availing most of the services, one has to provide his/her Aadhar Card for Verification Purposes. The problem arose when people felt that their privacy is dripping as for most of the small verifications they have to provide their Aadhaar Card. Like for a Verification related to Name and Address, you have to give your full Aadhaar which has more details then just Name and Address. Due to this privacy concern, UIDAI came up with a new Solution by which anyone can locally verify his/her Identity without providing any extra information than required. UIDAI want to make a method by which you can verify your Identity without providing your Aadhar or without using UIDAI servers. As only providing the required information protects your privacy and not using UIDAI servers make sure that you don’t rely on UIDAI for the verification purposes. Like many times when UIDAI server goes down, people can not prevail the service until the server goes live. For a busy person, it becomes a huge problem as he/she goes into a delay of 1-2 Days. By using local e-KYC provided by UIDAI, a person can generate a digitally signed XML file which can be used for offline Verification. Do you want to Generate your own Local e-KYC file? Then you are in the right place. Generation of Local e-KYC is a simple procedure by which you can Generate your own Digitally signed XML file for Verification. You can choose what to share and what not to share according to your Verification needs. It may sound confusing for the first time, so make sure that you follow me step-by-step to ensure that you are doing everything alright. P.S. – You must have your Registered Mobile Number with you. 2. Click on Aadhaar Paperless Local e-KYC under Aadhaar Services section, and you will be redirected to another page. 3. 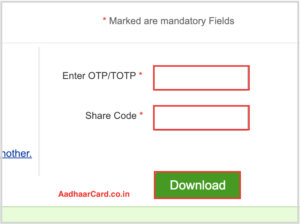 Enter your Aadhaar Number or VID, Security Code and Click on Send OTP or Enter TOTP depending on your Preference. 4. Enter your OTP/TOTP in the first box, Enter a 4 Digit password in Share code Box and click Download. Note – By Default, all your Information like Photo, DOB, Email, Mobile Number, Gender and Address will be included in the XML file. The XML file you downloaded from UIDAI for Aadhaar e-Kyc is in a Zip format which is a compression format, i.e., the File is compressed. You can use the file only after unzipping it. Some of you may want to know How you can Unzip the downloaded file. Well, Today I will share How you can Unzip the Aadhaar XML File. It is straightforward, and I have put it in straightforward steps too, so without further ado, let’s get started. 1. Download Any Unzip Tool. You can search for “Unzipper” in Google and download the one you like. 2. Now find your downloaded file and right click on it. 3. Click on Open with and choose your Downloaded Unzipper tool. 4. It will ask you to enter a password to unzip the file; the password is the Share Code you set up during the download process. 5. Click on Ok, and it will be Unzipped, and you can then use it. In this article, I talked about Aadhaar Local e-KYC by which you can Verify your Identity without providing your Aadhaar Card and without using UIDAI servers during verification. It is an excellent step towards Verification as it protects the privacy of people as now they can choose what to share and what not to share. I hope you like this post and if you do then don’t forget to leave a comment and share it with your friends.